Monarchs on the Mississippi River! Bellevue State Park, near Bellevue, Iowa, just south of Dubuque, is located atop a 300-foot high limestone bluff with panoramic views of the Mississippi River valley and Lock & Dam 12. It also shelters the largest Butterfly Garden in Iowa. The Garden Sanctuary for Butterflies near the South Bluff Nature Center in the Nelson Unit contains a variety of interesting displays on the plants, animals and geology of Bellevue State Park.
. This unique area contains over one hundred separate plots, each featuring plants which provide food and habitat for butterflies. A network of pathways allows visitors to walk through the garden and see a wide variety of butterflies as well as enjoy the beautiful array of flowers and the pond in the center. For more information visit the website at Butterfly Garden. According to the Iowa Department of Natural Resources, butterflies found in Iowa are either in the process of migration or are completing one of the various stages of their life cycle. Approximately 60 species of butterfly can be expected to make their appearance at the Butterfly Garden each year. Host plants for butterflies include wild aster, ragweed, goldenrod, lamb’s-quarters, daisy fleabane, milkweed, cottonwoods, wild cherry, hackberry and willows. Monarch Butterflies Migrate Along the Mississippi River…Destination, Mexico! www.greatriverarts.com Click map to learn more! The Garden Sanctuary for Butterflies contains over 100 separate plots, each featuring plants which provide nectar for adult butterflies and/or host plants for caterpillars. Pathways allow visitors to enjoy the wide variety of butterflies and flowers. An area has been established next to the garden to allow close-up viewing of the butterflies. c Pat Middleton. May not be reproduced or used in any format without permission. The gentle shift to fall is palpable around us. The sun sets southward, over the neighbor’s pathway, rather than behind the northern bluffs. Geese fly from cornfield to cornfield in great flocks. 64 degrees today, 40 tonight. We gather firewood. For the second year in a row, a swarm of Monarch butterflies have set up camp in the old cedar in the side yard. They hang motionless from the branches–like dull brown seed pods–until a late-comer flutters by. Then all gently beat their orange-colorful “hello” and “where’ve you been” until the traveler, too, is accommodated comfortably to its own berth for the night. About this time of year we begin to notice more monarch butterflies fluttering in the wind and congregating (or staging) in areas where bountiful supplies of nectar are available. But what isn’t readily apparent is that those butterflies are moving with a purpose and direction. Every year, in late summer and early fall, millions of monarch butterflies from the Eastern United States and Southern Canada find their way to Central America. This is a journey of more than 2,000 miles from the Upper Mississippi River. The monarchs are heading to the Transvolcanic Mountain Range, located west of Mexico City, to spend the winter. They gather there in huge colonies of tens of millions of butterflies, literally hanging from fir trees in clusters so thick they look like bundles of dead leaves. The butterflies arrive in November and remain largely inactive until undertaking the return trip north in mid-March. 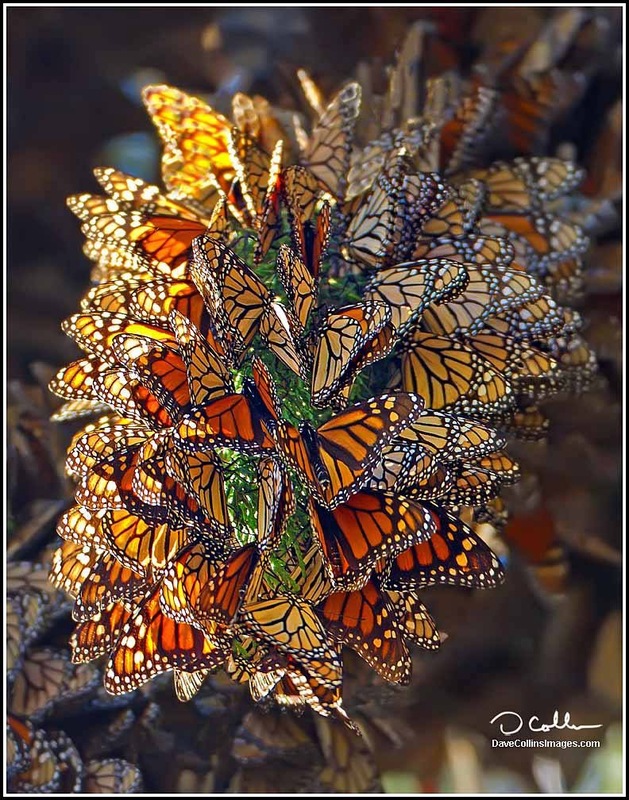 How they find their way is a mystery because the monarchs that leave Mexico in spring are at least three generations removed from those that will make the journey back in the fall. 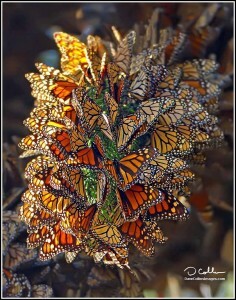 Monarchs leaving the wintering areas migrate 800 miles to the Southern United States, where they lay their eggs. The next generation on monarchs continues the northward migration to the upper United States and Canada. This continued movement north is necessary because southern milkweed plants die out in June. Two to three more generations are produced during the summer before the monarchs begin to flutter their way back to Mexico. About 12 wintering sites have been identified in this mountain range of central Mexico. The monarchs are attracted to the high altitude fir forest of these sites because the combination of temperature, humidity, and wind velocity create the conditions essential to their survival. The canopy of the fir trees also protects them from large temperature fluctuations and winter storms. Unfortunately, monarch experts say bad weather is not the greatest threat to the butterflies. As is the case in other forested areas, habitat destruction by humans is a much more serious concern. A monarch reserve has been created by the Mexican Government, but the reserve on includes five of the known wintering sites. In addition, logging pressure is heavy on 75% of the reserve area. Logging affects the microclimate to such an extent that either the monarchs may not use the site, or if they do, their survival over the winter is dramatically impacted. In order to insure that the phenomenon of migration doesn’t disappear, it is very important that humans find some way to work together to preserve the livelihood of the local people in the wintering sites, which in turn would lower the economic pressure on the monarch reserve. Along the Mississippi is an ongoing series related to the Mississippi River. Articles are prepared by officials with the Wisconsin Department of Natural Resources and comments can be directed to the DNR office in La Crosse, Wisconsin. We’ve recently added this section for those who wish to follow the Monarchs to Mexico. The most visited sanctuary is El Rosario, and the best place to base yourself is the town of Angangueo, an old mining town. Seeing the butterflies, so thick that they sometimes BREAK tree branches (!) will require hikes of up to three hours, though it is not a strenuous hike. It is recommended that visitors hire a local guide or travel with a guided tour group. If you approach from Brownsville, the first important city you will reach will be Ciudad Victoria, capital city of the state of Tamaulipas. By continuing on south you will cross the Tropic of Cancer at Jaumave, and at every mile you will notice more and more butterflies which often take the attention of even the disinterested tourist. At CiudadMante you will be at the very foot of the Sierra Madre Oriental range. Just south of Ciudad Mante the highway divides — one route goes to Tampico on the coast; the other veers southwest into the mountains towards Mexico City. Be sure to choose the latter route for best butterfly viewing. This route takes you to Nuevo Morelos and CiudadValles, and there is good butterfly viewing all the way from here down to Tamasunchale. Our guided tour itinerary will give readers and idea what to expect from a journey. Looking for a good organization to travel with? Search the Internet and also have a look here. Natural Habitat World Wide Tours offers tours (you guessed it!) world wide. From Mexico City, travel through the central highlands to the picturesque mountain village of Angangueo. The nearby Rosario Butterfly Sanctuary offers your first encounter with the king of the butterflies. The path is groomed, but sometimes fairly steep, trail with convenient benches for occasional rests. At the epicenter of millions of monarchs cover the tall oyamel and fir trees! Mexico’s sanctuaries may be the only places in the world where you can actually hear butterflies’ wings beating. Many Mexicans still hold the Aztec belief that the souls of the dead are reborn as monarchs. The Chincua Butterfly Sanctuary offers a second memorable experience with the monarchs. For those who choose, horses are available for this excursion. As Carlos Gottfried, president of Mexico’s Monarca A.C., says, “When you stand in a monarch sanctuary, your soul is shaken and your life is changed.” In Chincua, we ride our horses most of the way then walk down into the area of high butterfly density. Relax in luxury at the luxurious Hotel Avandaro Spa & Resort in Valle de Bravo. A visit to the Piedra Herrada Sanctuary is the newest spot opened for viewing the monarchs. Once again, horses take us most of the way and we then walk, often through thick vegetation, to the spot where the butterflies are located. This area is “wilder” than the other two sanctuaries and often provides a more remote nature experience. During your return trip to Mexico City, stop in Toluca, originally an Indian settlement dating back to the 13th century. Information: The El Rosario Sanctuary is accessible from either Angangueo or Ocampo. Angangueo is approximately 115 kilometers from Morelia and 205 kilometers from Mexico City.